meditation as a therapeutic form alongside psychological therapy. Homecoming: reclaiming and healing your inner child by John Bradshaw. Co-dependence: healing the human condition by Charles L. Whitfield. My favourite co-dependence book. Shame: the power of caring by Gershen Kaufmann. Embracing your inner critic: turning self-criticism into a creative asset, by Hal Stone and Sidra Stone. Why love matters: how affection shapes a baby´s brain by Sue Gerhardt. A secure base: clinical applications of attachment theory by John Bowlby. Overcoming destructive anger, strategies that work by Bernard Golden. A good model and log to explore own´s anger. ce positivity in one´s life. Getting beyond sobriety by Michael Craig Clemmens. Addictions from a Gestalt perspective. In the realm of hungry ghosts: close encounters with addictions by Gabor Maté. A compassionate/developmental view. The body remembers by Babette Rothschild. 8 keys to safe trauma recovery: Take-charge strategies to empower your healing by Babette Rothschild. Empathic self-help. Walking the tiger by Peter Levine. A bit heavy reading. 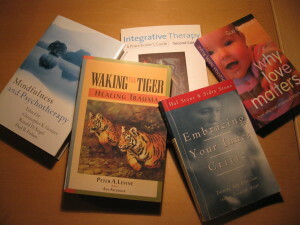 The Trauma Centre at Justice Resource Institute, Boston USA: clinical services, research, courses, publications. The body keeps the score by Bessel Van der Kolk. A good integrative summary of the trauma field. Scattered: How attention deficit disorder originates and what you can do about it By Gabor Mate. Developmental approach.